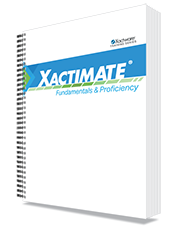 The Xactimate Fundamentals Training Workbook is designed as a supplement to classroom training or as a stand-alone guide for new and intermediate Xactimate users. The workbook progresses to proficiency topics including Macros, Templates, and Xactware Pricing Methodologies. The workbook includes a broad array of lessons and practice estimates applicable to the work that a general contractor or loss adjuster may encounter. It is structured in a modular format to also teach specialized groups such as roofing and mitigation contractors, as well as commercial loss adjusters. Practice estimates include small to large residential and commercial losses for water, fire, wind and hail damage.